I searched the forum and did not find any related post. Back in June, I paid a flight ticket at edreams.ch in CHF using my credit card. The payment went through paypal for better security. I was charged 1.5% at my credit card statement for "payment in CHF in foreign countries". 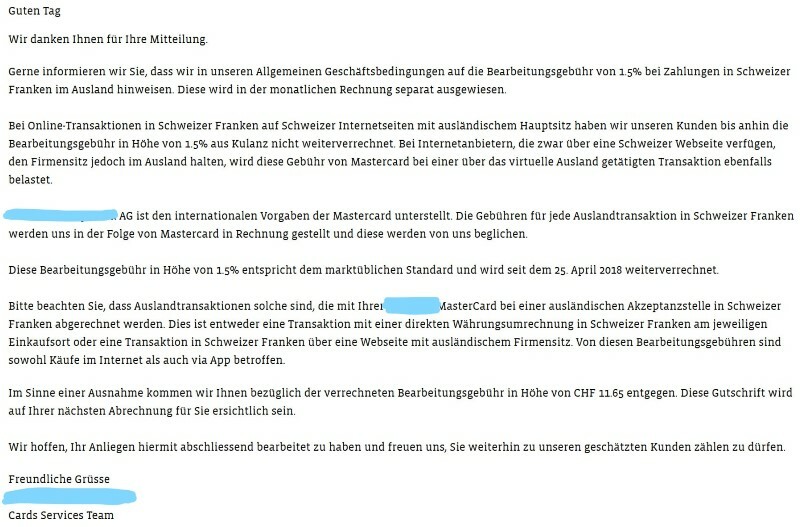 The card issuer explained that payments made on a Swiss website with foreign domicile are considered "payment in CHF in foreign countries". They finally gave me back the charge as an "exception". Anyone has similar experiences? How could one find out whether a website is owned by a non-Swiss company? I attached their reply (in German). Yes it's perfectly normal. Easy Jet is another example. If you have a premier expensive credit card, they you don't get those charges. Start using revolut and then such issues disappear, plus you will save yourself some money, due to the great exchange rates. Recently I booked a expensive flight ticket on airline website(omanair) and paid in CHF through credit card. It would have been better if bank site shows this surcharge information before final authentication rather than just showing in the statement. How one knows if transaction is happening in Switzerland or abroad? How does the website know the T&C's of YOUR credit card, it just approves a charge. Website/Airline should not know/care about it for sure but banks could show this warning or information at the time of two factor authentication or some other way rather than just putting a small point in t&c. Looks exactly like the response that I received, except for the part where they refunded the charge - I didn't get a refund, mine would have been around 40chf. I have since started using a PostFinance VISA card for online purchases. Although the card costs 50CHF/yr, it does not have any fees for purchases abroad in CHF. However, according to this article you should avoid paying in CHF abroad since the applied conversion rates are not very good. Apparently you are better of paying in the original currency and paying the surcharge. Actually I was thinking about having Revolut as my ONLY cc. What I don't know is whether revolut cards are expected as security deposit (such as car rentals) since the revolut cards are actually debit cards. Never mind: I found the answer quite quickly: NO, most car hire companies do not accept revolut prepaid cards. Yes that's what I do with the websites which allows currency selection but not all website let you choose it. E.g. many airlines show fare in the currency where you start journey. He's right.. I use my Revolut Visa card for all transactions outside of CH now. The big question is why Swiss politicians don't intervene...Swiss credit card companies are thieves, no question about it....Revolut and Transferwise are options and should be used. I have the exact same issue with this cc: https://www.libertycard.ch/, which you might know as it was previously the one you got with your Halb-tax. They started charging 2% on all the payments they considered as "payments abroad". "Wie hoch ist der Zuschlag, wenn ich mit der Visa LibertyCard im Ausland bezahle? Bei Bezahlung im Ausland wird eine Gebühr für Fremdwährungstransaktionen von 2% für die Visa LibertyCard und 1,75% für die Visa LibertyCard Plus erhoben." ...which means they charge 2% on foreign currrency transactions. They started doing that only a couple of months. This is nothing special, pretty much every bank and every credit card has some fee for foreign transactions. Either they add a % on top of the transaction or they hide it through the currency conversions. As others have suggested, use Revolut, when possible, when doing something abroad. Also, watch out for "going through paypal". They also have their own fees. Thanks English forum posts, I have been users of both Revolut and Transferwise since end of last year. But I only have a few hundreds CHF. I am still skeptical to keep a bigger amount there. I know this "pay in your own currency" trick. The website I used to purchase my ticket directly shows prices in CHF. I use paypal to avoid leaking credit card details to various websites. Thanks for pointing out. This is exact the topic I was searching for. I started getting charged on transactions abroad only in April. For example, my DAZN subscription via the Swiss website was 12.90 CHF until April, but it costs me now 12.90 CHF + 2% because they consider it now a "transaction abroad". It is a joke. I do use Revolut, but until now it was only when traveling - I will start using it more now. Thanks anyway for the info.